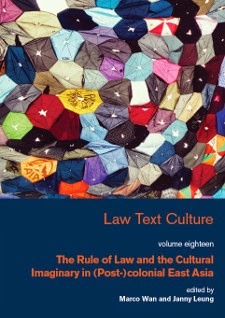 "The Rule of Law and the Cultural Imaginary in (Post-)colonial East Asia"
This volume of Law/Text/Culture explores how the rule of law is represented in a variety of discourses both within and outside the legal domain – including film, television, opera, court cases, and popular magazines – in East Asia. It re-orients the study of ‘Law and Humanities’ by shifting the focus from the Western World to East Asia, and presents a new approach to the study of East Asian legal culture by approaching the region through a post-colonial lens. The term ‘cultural imaginary’ is broadly defined, and includes articulations or representations of the rule of law in a range of cultural products in human society, including, but not limited to, the law itself. Other contributors to the special volume include Elaine Ho and Johannes Chan, Alison Conner, and Chris Hutton. Click here to download the articles.